ELIH International has various divisions and departments specializing in certain areas, such as Import,	Export, eVersand (mail order and small orders),	Logistik (logistics) und Manufaktur (manufacture). Each department is specialized on a specific task focusing the know-how and utilizing all necessary resources on the given task or challenge. Import	is processing the import of products. This includes global sourcing, negotiations, procurement, documentation and customs clearing. Transportation and logistics will be completed by Logistik. The department of import is matched by Export which takes care of any kind of export from Germany or the European Union into anywhere in the world. Export	covers the collection and/or the loading of the goods, transportation to the port/point of export, documentation and customs clearing. Of course, due to the excellent communication and cooperation with forwarding agencies and carriers, ELIH International can offer excellent conditions for transportation to the desired port (export by sea) respectively final destination (export by truck). All kind of logistics, such as coordinating and executing logistics including transportation, storing, picking, packaging, forwarding, are being processed by Logistik. From warehousing small quantities or short period storage to handling full container loads over long period of time, Logistik is your partner. Wholesaling and trade in large quantities is the heart of ELIH. Products and services of various kinds are being traded. Household, vases, art decó, gift items, textiles, bags, wall clocks, toys and much more. However, the main focus is on tableware, such as porcelain and glass items. 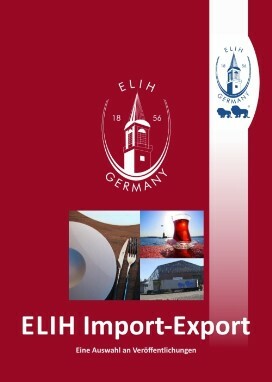 Trading area is primarily the European Union, nevertheless, ELIH International is trading globally utilizing the full capacity of eImport and eExport. The department of eVersand is serving retailers and stores with smaller quantities. This includes mail order service throughout Europe including member states of the European Union and non-EU-countries while the emphasis is on Germany. Smallest quantity in this segment is one carton. Worldwide trade is due to custom restrictions and regulations processed by	eExport. Porcelain items are being produced and manufactured by Manufaktur. Here, various qualities are being produced by distinguished manufactories, such as located at the "Porzellanstraße" in Bavaria, Thuringia, and Bohemia. Especially porcelain for hotels & gastronomy and decorated dinner-sets but also porcelain-sets for daily use are crafted in these sites. Hotel and gastronomy porcelain is by far the most resilient and meets highest expectations in its market. "ELIH Porzellan" is a quality promise which requires regular quality control and raises high expectations in manufacturing	porcelain. "ELIH Porzellan" meets various quality standards and is tested on a regular basis for safety, components and ingredients.